As far as fruit goes summer is my favorite time of year. All of my favorite fruits are in season right now and I can stock up on cherries, peaches and plums and have plenty of snacks and try out all sorts of great recipes for desserts. Sure pies and cobblers are great, but I saw this particular recipe in Bon Appetit for a plum tart that was so easy and looked so delicious that I just had to give it a try myself. You can easily use peaches or apricots in this recipe instead of plums if you prefer (really any stone fruit will do well with this one) and if you keep some puff pastry around in the freezer for those last-minute desserts when you need them you put this together in under an hour, including your prep and thaw time for the pastry. Preheat the oven to 425 degrees. Cut the puff pastry into six 4-inch squares and place them on a parchment paper-lined baking sheet, making sure to prick the pastry all over with a fork so it does not puff up while it is cooking. 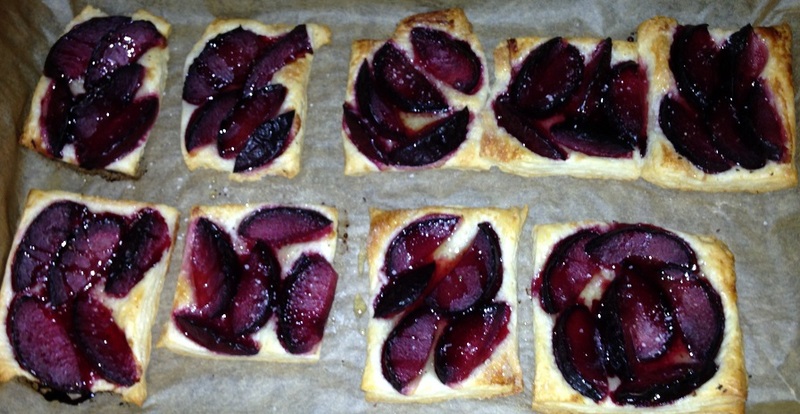 Top the pastry with the plum wedges, leaving a 1/2-inch border around the edge if possible. Sprinkle the plums with the sugar and then season them with a few grinds of freshly ground black pepper. Bake the tarts, rotating the pan halfway through the baking process, until the edges of pastry are puffed and golden brown, about 25 to 30 minutes. Drizzle the tarts with honey and sprinkle each tart with some sea salt just before they are served. You can make these tarts a few hours ahead of time and just keep them at room temperature and they will be perfect for dessert. Don’t be afraid to maybe add a little bit of homemade whipped cream on the side when you serve them either. You get great flavor from the plums and the honey and black pepper really bring out some great additional flavor to the whole dish. This one was so easy to do and tasted and looked great so I am sure I’ll be making it again before the summer is over, either with plums again or maybe I’ll give it a whirl with some fresh peaches.